The PCA9556 is a silicon CMOS circuit which provides parallel input/output expansion for SMBus applications. The PCA9556 consists of an 8-bit input port Register 8-bit output port Register and an SMBus Interface It has low current consumption and a high impedance open drain output pin, I/O0. The SMBus system master CAN reset the PCA9556 in the event of a timeout by asserting a LOW on the reset input. The SMBus system master CAN also invert the PCA9556 inputs by writing to the active HIGH polarity inversion bits. Finally, the system master CAN enable the PCA9556 s I/Os as either inputs or outputs by writing to the configuration Register The power-on reset puts the Registers in their default state and initializes the SMBus state machine. The RESET pin causes the same reset/initialization to occur without depowering the part. The PCA9557 8-bit IC SMBus I/O port with reset is the higher performance pin-for-pin replacement for the PCA9556. This is one package pinout of PCA9556,If you need more pinouts please download PCA9556's pdf datasheet. 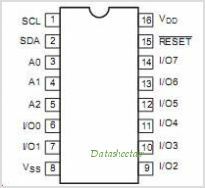 PCA9556 circuits will be updated soon..., now you can download the pdf datasheet to check the circuits!